Hair loss is a natural part of aging, and it affects everyone to some degree. The average person sheds approximately 100 hairs per day. Even though the body naturally replace these lost hairs, it becomes harder for it to do with age. Each strand of hair rests in a tiny hole in the skin, called a follicle. Hair loss occurs when hair follicles shrink over time, causing thinner, shorter hair. There are many causes of hair loss, like stress, hormone fluctuations, and certain medications. Keep reading to learn more about the common causes of hair loss. A number of factors can contribute to hair loss, but fortunately, most are easily controlled. Changes in estrogen and testosterone levels can trigger hair loss. Testosterone excess causes hair follicles to shrink, so when estrogen levels drop during menopause, testosterone levels are relatively much higher, resulting in hair loss. Stress is a primary cause of hair loss in both men and women, known for accelerating hair loss. As previously mentioned, hair follicles shrink over time. Consequently, after natural shedding occurs, there is less regrowth to replace the lost hair. Having a family history of premature balding increases the risk of experiencing hair loss at an early age. Frequent use of hot tools, harsh chemical treatments, and dyeing can worsen hair damage and loss. What you eat is of vital importance to how you look and feel. Eating fried, salty foods high in saturated fats is commonly linked to hair loss, acne, and obesity. Certain vitamin deficiencies can also impact hair loss. Vitamins like vitamin C and B6 are vital for maintaining healthy hair and promoting hair growth. Iron deficiency is also a leading cause of hair loss. Certain medications - like oral contraceptives, antidepressants, and blood thinners - can cause hair loss as a side effect. It is important to be aware of the potential side effects of your medications. Herbal remedies like hot oil treatments with natural oils can be beneficial in promoting hair growth. Try warming up coconut, lavender, rosemary, or jojoba oil and gently massaging the scalp with your fingertips. The warm oils feel relaxing, helping to reduce stress. Vitamin supplements can also be helpful in encouraging hair growth. The scalp uses vitamin A to create sebum, which is the oil that lubricates the hair roots and prevents hair from drying out. B-complex vitamins help circulate blood and strengthen hair to prevent hair loss. Both of these vitamin supplements are widely available at most health food stores. 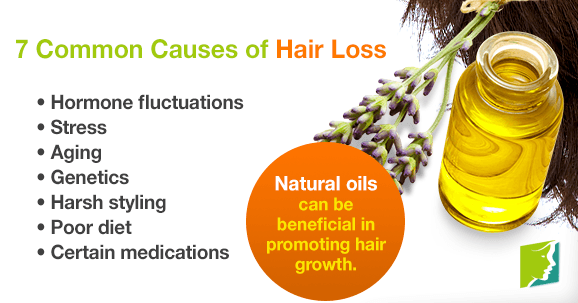 Also, herbal supplements for hair loss can be a good option. Hair loss is a frustrating part of aging. It affects both men and women and can occur as early as your 20s. It is important to be aware of the common causes of hair loss to be able to avoid them. Helpful prevention methods include exercising regularly, reducing stress, eating healthy, and practicing stress reduction techniques. Read complete information about hair loss treatments. Are Poor Diet and Hair Loss Related? Sudden hair loss is a common but upsetting problem that affects many young women. Read on to learn more about sudden hair loss in young women. How Can I Disguise My Thinning Hair? It's no secret that hair loss sometimes comes with menopause, but that doesn't mean you won't want to hide your menopausal thinning hair. Hair loss and thinning is a common symptom of perimenopause. Click here to learn more.